A reliable, familiar destination is a wholly understandable impulse in choosing a golf experience, especially when time, and perhaps money, are at a premium. But having one’s expectations confounded is often as entertaining as having them confirmed. 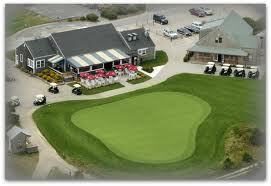 So it was with a recent trip to Miacomet Golf Course, on Nantucket, off Cape Cod. Even if your first-hand acquaintance with Nantucket is confined to the bawdy lyrics of a locker-room limerick, you know that as a favorite vacation spot for rich and famous Eastern Seaboard denizens, the real estate has to be among the most expensive anywhere to be found. And for golfers, even the names of the island’s courses – Miacomet, Sankaty Head, and Nantucket Country Club – have a venerable, larger-than-life aura to them. The latter two are avowedly private, but Miacomet – from a Native American word for “the meeting place” — has a refreshingly common touch, and not simply because it is the only public course around. The original nine holes, in fact, were laid out not by a luminary of the golden age of golf architecture, but by a local farmer named Ralph Marble in 1964, part of a modest recreation complex on the site. The entire parcel was purchased by the Nantucket Land Bank Council, the current owner, and, after copious debate about how best to use the precious resource, nine holes were added in 2003. Designed by Howard Maurer, a protégé of Geoffrey Cornish and Brian Silva until hanging out his own shingle in 1997, the new holes are interspersed with the old track rather than added as a completely new side. For all that, Miacomet exudes a “traditional” ambience beyond its years, due mostly to design elements we tend to associate with so many classic courses. Fairways are tight and firm, frequently delineated by tall fescue grasses, and the predominantly flat topography and characteristically windy conditions – how to put this? — simulate linksland play. The older holes, in particular, have features reminiscent of a bygone era. Approach alleys to greens are typically unprotected by bunkers and other hazards, thus inviting shots of various trajectories, but, at an average of 3,000 square feet, putting surfaces are half the size of those on the new holes. Bunkering, while not of pot-like dimensions, is generally not as wide or as deep as more modern configurations, suggestive of the “blown out” bunkers on courses fashioned without mechanized earth-moving equipment. There are only three sets of tees – designated back, middle, and forward – ranging from 6,831 to 5,159 yards, par 72, and from slope 123 to 118. The course’s periphery is blessedly free of residential or commercial structures. Even the clubhouse, with a restaurant favored by locals and capable of hosting weddings and corporate outings, is discreet and unassuming – more Shinnecock than Riviera or Westchester. Not only can gusty winds make the slope rating seem a bit disingenuous, Miacomet has a number of quirks, including consecutive par 5s on the front nine, and memorable holes. Chief among these is No. 14, a 495-yard par 5 that requires either two world-class whacks or some uncommon restraint, as a water hazard that impinges from the left side of the fairway demands that a truly safe lay-up be struck with a short iron. There are also three par 3s that play longer than 200 yards from the back tees; and although No. 8, at 233 yards, is the longest, No. 3 — 213 yards into the prevailing breeze — seems just as difficult. And as a test of golf, Miacomet stands to get better: Maurer is currently working on plans to make the older holes more congruent with the newer ones. Specific objectives of the renovation are to standardize the contours and size of the green complexes and bunkering, to make the layout more of a piece. Finally, while the round of golf may always be the main event, the best of golf adventures entail a correspondingly enjoyable commute to and from the course. This was the case with our trip to Miacomet, which began with a chilly, below-deck ferry ride from Harwich Port at dawn and ended with a gloriously sun-washed, open-air return trip in the late afternoon. Nantucket Village’s upscale quaintness added to the quintessentially New England charm. It made for the perfect one-day excursion, though a multi-day stay is certainly not without its appeal. Miacomet Golf Course (www.miacometgolf.com, 508-325-0333) partners with Nantucket Island Resorts (www.nantucketIslandresorts.com, 1-800-islands), proprietors of a half-dozen accommodations on the island, in arranging both, as well as special events. For information on transportation options to Cape Cod, Nantucket, and Martha’s Vineyard, try www.smartguide.org.